According to IBIS World, the juicing/smoothie industry had market size of 2 billion with an average of 2.9 percent growth over the last five years. 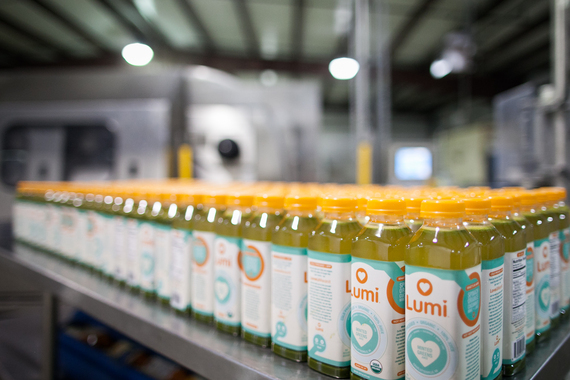 At present there are at least 8 key "raw juice" brands active in the marketplace -- Suja, Blueprint and LUMI Organics to name a few -- and it doesn't look like there will be a shortage of options any time soon. However, it's important to understand that consuming juice, similar to other food groups, should be done in moderation. While cold-pressed juices are "raw" in nature and contain a variety of vital nutrients from its fruit and vegetables, the juice form that results are easily absorbed sugars due to the elimination of the fiber and pulp. The recommended daily allowance of fruits (1.5-2 cups) per day and vegetables (3 cups) but drinking juices excessively could also turn into fat if not properly utilized as fuel (e.g., being active or exercising) and if you're at risk for diabetes or diabetic, all the more reason to proceed with caution. At present, most commercial juice brands (i.e. Tropicana) undergo pasteurization -- a process by which foods are heated to a specific temperature for a specific amount of time to kill (or deactivate) a target number of potentially harmful bacteria. The most apparent downside to pasteurization with respect to cold-pressed juice is the loss of vital nutrients found in fruits and vegetables, thus minimizing the full health benefits. Studies have shown a loss of vitamin C and certain phytonutrients (especially phenols) due to pasteurization. Most raw juices do not undergo this process, and as a result, could potentially pose as a risk to pregnant, elderly or those with weakened immune systems. Most recently, High Pressure Processing (HPP) has been making an appearance within a few different industries (e.g., deli-style fresh packaged meats, guacamole dips, seafood and ready-to-eat meals) including juicing. High Pressure Processing is a process that maintains the vital nutrients of fruits and vegetables while killing harmful bacteria -- maximum health benefits without the risk of getting ill. According to Hillary Lewis, founder of LUMI Organics, a cold-pressed, high-pressure processed fruit and vegetable juice brand, many juice brands do not engage in HPP due to the cost associated with the process. From the consumer's perspective, however, the 16-oz bottle of juice is not any more expensive for undergoing HPP. 1) Bacterial Elimination -- Once bottled, High Pressure Processing (HPP) applies extreme water pressure to inactivate harmful bacteria, while preserving the vital nutrients. HPP is a natural way to preserve food because it eliminates the microorganisms that cause spoilage without the harmful effects of using chemicals or heat, which in turn, destroys the beneficial nutrients. 2) Extends shelf life up to 8 times -- Without some processing, cold-pressed juice safely lasts only 72 to 96 hours. 3) Extreme Cold Water Pressure -- HPP uses 87,000 psi (that is five times the pressure at the deepest part of the ocean!) to neutralize harmful bacteria; no heat needed! 4) A Natural Process -- HPP maintains the integrity of the nutrients because it does not require added chemical preservatives or heat. So what should a consumer pay attention to when choosing a juice brand? 1) Has the juice undergone HPP or heat-pasteurization? While it is not regulated to include "heat pasteurization" on the label, those who have undergone HPP will certainly note it as it is a selling point in comparison. 2) Are the ingredients organic? Take a look at the label to ensure the USDA Organic Seal is present. That seal is also your signal that the juice you are about to consume is non-GMO -- a strict standard for any product to be certified as organic. For produce such as leafy greens that have increased exposure to soil and water run-off, organic makes a difference. 3) Does the label say 100 percent juice? If the label doesn't state 100 percent juice, according to Lewis, it is likely that the juice may have water added or additives such as stevia. 4) What's the first ingredient on the juice list? The FDA regulates both the nutrition facts and ingredient list. The ingredients will be listed by the most predominant onwards. Therefore, try to choose a juice with the first ingredient as a leafy green like spinach or kale. As a dietitian, my suggestion is to pay attention to your juice labels and of course, consume in moderation.